Last year when the Kardashian sisters announced their new extension to create their makeup line, Khroma, I had the urge to get it. I've always love Kim Kardashian's smokey eyes and contoured face. It's been months since the launch, and I still haven't got my hands on any of the Khroma product. Before I can even get it, the three sisters are facing a $10million law suit against their brand Khroma. 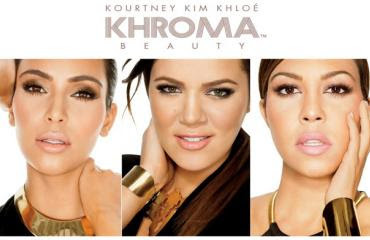 Miss Lee Tillett alleged that the Kardashians are infringing her trade marked brand Kroma, which is also a business dealing with makeups and beauty stuff. She contended that the Khroma brand resembles close similarities with her brand Kroma and that it creates confusion in the market place. And by using the name Khroma, the Kardashians are ripping off her brand name. The judge ruled in favour of Tillett and ordered the Khroma products to be pulled off from the shelf. Well, at least there is no actual problem with the product itself. I still wish to try their stuff. Now we'll just wait for the Kardashians to rename their makeup line. Do you have anything from Khroma? Is it good? I haven't tried any Kroma products yet because in The Netherlands we have to order them online and I'm still not sure if there's anything from the line I'd like to try. Guess it's too late now. From reviews online, I don't think I'm that interested. Except maybe...Kourtney's palette. However, I got my eyes on the Flower Cosmetics by Drew Barrymore. The packaging is also cute. @Kell: I think they will only change the name but they will still on business. @Sabrina Tajudin: Oh is it? I didn't know they got sued before. LOL! They should come up with better names. Khroma isn't that nice anyway. @Nisah: Yeah! I wanted to try Flower as well. But it's not as popular as the Kardashian's brand. I'm not really sure where to get it.